Our digestive tract is one long, continuous tube that is essentially “open” to the outside world via the food we eat. The barrier between our digestive tract and the rest of our body is vital – its job is to selectively allow specific nutrients and fluid into our bloodstream, and to keep out pathogens, allergens, and larger food molecules. However, this barrier can be compromised by things such as infections, antibiotic use, alcohol, and a diet high in sugar and processed foods. When this barrier is altered, inflammation, as part of our immune system, comes to the rescue. A little inflammation is necessary, but chronic inflammation can lead to major health problems, such as food intolerances, nutrient deficiencies due to poor absorption, and even serious chronic conditions like Ulcerative Colitis and Crohn’s Disease. Eating foods that are naturally high in anti-inflammatory compounds can help support a healthy gut! What are the best foods to quell inflammation? Wrongly demonized for too long, we now know that some fat is healthy and vital! The trick is choosing the best ones. Whole food sources such as avocados, eggs, nuts and seeds should be eaten daily. 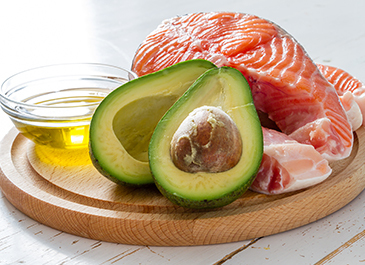 When you need to use oil for cooking, use extra virgin olive oil for low or medium heat, while avocado or camelina oil is ideal for higher heats. Regularly include anti-inflammatory omega-3s in your diet. Oily fish such as wild sockeye salmon is an ideal choice. 7-10 servings of dark and brightly coloured veggies and fruit should hit your plate. Every. Single. Day. Hate counting? Just cover half your plate with produce at each meal and snack. Sneak more in by adding veggies to smoothies, soups, curries, and stews. Many culinary herbs have been used for centuries to flavour our food also happen to have other benefits. Turmeric, ginger, and cardamom have all shown to have anti-inflammatory properties. For a warming, anti-inflammatory drink, add these spices together with some coconut milk, honey and a crack of black pepper. Heat in a small saucepan, stirring constantly, and enjoy!